but how did he get there ? that I really wish someone to extend story for me to what happened after with him ? CABAL obviously recovered Kane's body somehow; nothing complicated about it. If you watch the GDI intro video from Firestorm it should be obvious that although FS does happen right after TS, there's still a little time in between TS and FS. In the video you see Tratos calling Dr. Boudreau saying he has made a mistake, while Umagon is visible on a monitor in the background of Tratos' feed. Supposedly the antidote that was administered to Umagon in the final GDI video from TS isn't working and in fact only further mutated her and for this reason he asks for the Tacitus and Kane's research to be transported to him at once (I'm assuming he thinks he's still able to save her). After this is when the Kodiak gets hit by lightning while transporting the Tacitus and Umagon obviously wasn't on board considering she was confined by Tratos after she apparently lost her mind. For as far as I know it's never directly made clear that McNeil was on board of the Kodiak when it crashed however, although it's not unlikely (regardless, even if he did die, the main reason for this was surely that hiring his actor again would've been too expensive). And if McNeil was actually alive during Firestorm, the (canonical) reason he made no appearance would most likely be that he was on board of the Philadelphia and it was impossible to make contact with them during the whole game (connection with the Philadelphia is also lost during GDI's intro video, which is the reason why Solomon wasn't in charge during FS). how does Kane then come back in C&C 3 ? did someone unplugged him, and thus killed CABAL ? CABAL was never against Kane and Kane wasn't "trapped". CABAL was helping Kane to heal quicker. Additionally, CABAL was made from Kane's mind in the first place. CABAL didn't care about Nod; he only cared about Kane's goals and to achieve them by any means necessary (even if it means to turn on Nod). CABAL was indeed likely created with technology that was acquired from the Tacitus, but as Adam Isgreen described, CABAL's mind was in a sense a copy of Kane's when he was created. C&C3's story wasn't written by the same people who wrote the story for TD, TS and Firestorm and as such, there's of course some plot holes. EA seemed to have mostly just forgotten about CABAL (and Firestorm's ending) and they only brought in some indirect references to CABAL after the community made clear that they wanted to see CABAL. This was always the main problem with EA in the first place; their priority is never to continue and build on the existing storyline as seamlessly as possible, but only to add what they think the players will consider to be "cool" and that's the only reason why Legion made an appearance. I'd go further and say that Kane IS CABAL. It's just deviated too much from original Westwood intents. GDI was supposed to make atmospheric filterers from the knowledge gained from Tacitus (since Firestorm) among other things as situation was extremely bad shape, like year or two(?) and atmosphere would be 100% toxic to humans. I agree. A lot of events from the original story were simply ignored and it only gets annoying if you try to pay too much attention to the plot holes while playing the campaign. At some point Apoc (the community manager at the time) was even asking in the EA C&C forums why people wanted to see CABAL return and what makes him so interesting. There never should've been a question of "why" in the first place; CABAL was a major presence in Firestorm and after the cliffhanger that Firestorm's ending gave us, it makes no sense to just forget about him if EA's story writer really actually cared about the original story at all. CABAL is basically a digital copy of Kane's mind, but they still think independently, while still having the same goals. So Kane Kane's is not actually CABAL and while Kane could also decipher the Tacitus, I'd assume that CABAL could do it a lot quicker and far more efficiently, considering that he's a computer. Well, FS' ending implies that Kane never survived the Ion Cannon at the end of the First Tiberium War. Kane died then. But CABAL survived. And CABAL cloned Kane, and then the Second Tiberium War happened. Kane dies AGAIN! And CABAL begins to create a Kane clone... but this time CABAL doesn't have to wait until Kane is finished to enact Kane's plans. CABAL realises that he can make Kane's wishes come true before Kane's new clone body is even finished. Because CABAL realises he doesn't need Nod anymore. Kane doesn't need Nod anymore. At least, that's how I like to think about it. You could interpret it that way, but it really doesn't imply that. CABAL is merely speeding up the healing process for Kane; he's not cloning him. Also, unfortunately it was confirmed that Kane really is the biblical Caïn, who can never die. And while I did like the biblical references (because they were given a sci-fi twist), turning Kane into a real biblical person who's actually cursed live forever by "God" kind of ruins the story for me. It just really feels out of place in a sci-fi setting that has aliens and everything. The mask that Kane wears in TS are to cover up the scars he received after surviving the Ion Cannon blast in Tiberian Dawn. In any video transmissions Kane digitally covered up the mask and scars. may I know how you know this last what you wrote ? and also, didn't Ion cannon fried him as whole ? I know a lot from quotes from the staff at Petroglyph and IIRC there was also a mention about this in the TS manual. Unfortunately the old Petroglyph forums were taken offline (you can now only access the new Grey Goo forums), so I can't give any exact quotes or direct links (maybe some stuff can be salvaged via the Wayback Machine though). You can clearly see scars coming form under the metal plate and I think it's safe to assume that a chunk of his face is missing under that plate. Also, If you look at any of the videos, you'll notice that Kane has no visible scars (or plate) whenever he's visible via a video transmission (which is most of the time during GDI's campaign and all the time during Nod's campaign), but the scars and plate are always there when he's somewhere in person. Well, Kane being the biblical Kane doesn't necessary mean that he's the "biblical" Kane. For all we know WW pulled an ancient aliens "The Chariots of the Gods", with the Scrin being God or pretending to be (a) God, Kane being the rebel, and it all ending with GDI taking on Kane, Nod and (the) God(s). intro of TS itself, what the hell was so significant about Phoenix base ? Well obviously they had to make the first mission simple and easy for new players, yet in the cutscene they had to make it sound important enough to call for McNeil. I don't think there's anything more to it. did it came from that little ship from TD that crashed ? The Tacitus was on board of a ship belonging to Scrin rebels, which crashed to earth somewhere around the end of the first tiberium war (Tiberian Dawn). The Tacitus and the Scrinship that carried it were ever mentioned or shown in any of the games however and the object that many people mistook as a UFO in TD is nothing but a helicopter canopy. It is a spaceship. It is credited to Sean Brennan with in the C&C95/TD manual. Nyerguds has in in PDF fourm page 88. Also it is much clear-er in the N64 version that it is a ship. It's also important to remember that C&C concept art was much closer to Tiberian Sun in style than the C&C we got, with power armoured soldiers, cyborgs, EMP tanks, all sorts of cyberpunkian madness - along with Scrin ground soldiers. was it ever written when Slavik was killed (date) ? Considering that this concerns the TS/FS story, Slavik was never killed. Seems that I missed this post, but it only shows that tool tip in the N64 version of TD and this wasn't made by Westwood. The Westwood staff confirmed that it's really a helicopter canopy at the Petroglyph forums (I never knew this myself either before then). What it came down to is that no one could figure out what the thing was and when fans started assuming that it must be a UFO, Westwood just found it amusing and never bothered to correct them (which is why the developers of the N64 version ended up making it into a real UFO). Your so-called UFO isn't a terrain object, overlay or a structure, but it's regular terrain (just like grass and water) and regular terrain can't display any tool tips. I other words, what you're saying is impossible. C&C3 wasn't made by Westwood, so it's not relevant to the TS/FS story (which was ignored for a large part in C&C3 to begin with). But does any manual or anything says when his murder happened and if someone played 3 and 4, does kane ever mentiones slavik at all ? As Bittah Commander pointed out there is no tooltip for the debris in TD so your most certainly wrong (not to mention the whole discussion would be kinda pointless when the tooltip flatout tells you what it is ). There might be one in CnC64, but that wasnt made by the orignal staff. Slavik is mentioned by Kane in KW - one of Marcions followers killed him sometime after FS. is there some sort of more detailed story for Slavik ? what are those for ? long story short, even westwood always had planned to make "kain" the biblical kane, he was banished to live forever on the planet earth, means that he can't die. they did try way too often to kill him huh? Cabal is Kanes failsafe in case he is absent, or has to recover like we've seen. This "failsafe" was just a bit "too" enthusiastic and likely went rogue, but always stuck to the original plan largely.....just the methods were a bit more...lets say "efficient". its safe to assume kane brought the cabal AI back because he knew what went wrong and maybe "altered" it a bit. Unlikely, why would they fly away like they did if they were mere fuel tanks? It's more likely they were some sort of secondary Tiberium containers. The bigger question is, what is the glowing, alien object exposed from the missile that triggers the world-altering process? Some say it's the Tacitus, but this cannot be true. First of, considering the size of the missile (as seen in the cutscenes), the object is much, much larger than the Tacitus we've seen. Secondly, the Tacitus is depicted as a perfect sphere, something the object is not (it appears to be a regular dodecahedron). just in a more global widespread scale in the video. The glowing thing seems like the essence of Kane combined with Tiberium. but doesn't it clash with firestorm ending then ? After watching the video again it's clear that those missiles indeed can't be fuel, or at least not fuel that's supposed to assist the main missile with leaving the atmosphere since they don't appear to ignite before that. Given that the small missiles do fly away at a significant speed after the main missile is in space already, it's likely that the small missiles do mostly contain fuel and maybe an amount of tiberium to seed nearby planets, moons, asteroids and so on. That's obviously pure speculation though. I doubt that's the case, considering that the missile is taking off behind him when this happens, so this wouldn't be a very effective method to get Kane's essence on a missile that's practically already gone. Kane also can't simply disintegrate (and thus kill) himself at will, considering that he can't die in the first place and if it was possible, it'd have happened when he stood directly in the center of an Ion Cannon blast during TD's ending already. Considering that the explanation for Kane's persistent existence was unfortunately confirmed to be biblical rather than scientific, it actually wouldn't be unlikely for what's happening to Kane during Nod's TS ending to not be very scientific either. Maybe his existence is simply allowed to end now that mankind is about to go extinct. The Firestorm ending is irrelevant in this context, considering that Firestorm follows the TS GDI ending, while we're discussing the TS Nod ending. So there is no clashing. It's also unlikely that Kane was "fusing" with CABAL during the Firestorm ending. Since CABAL was originally made as a copy from Kane's mind to begin with, Kane's body was most likely kept in stasis to allow him to recover, while CABAL linked directly to Kane's mind in order to "update" himself or in other words re-synchronize himself with Kane's mind. B) A more spiritual reference who's part in reality was played by multiple people calling themselves Kane (See Sparticus), and thus disappeared when Nod won. Kane's character as a whole is a biblical reference, but that doesn't necessarily mean his existence cannot be "scientific" (or in this case realistic sci-fi). I also believe him disappearing was just his millenia-long imprisonment on Earth (i.e. the Land of Nod*) coming to an end and him finally dying/transcending. Why it happened like it did (him disappearing with a strange glow) might be related to his "fate", perhaps some sort of alien technology (perhaps extradimensional, 'cause sci-fi writers never get tired of using nth dimensions [n > 4] as plot devices) was keeping him from dying and likewise killed/transcended him at the end. *Instead of being a region on Earth, the biblical Land of Nod would refer to the entire planet. Thus Eden, if it ever existed, would be an extraterrestrial place. Interestingly though, Adam Isgreen claimed Kane was human, so he cannot originate from outside the Earth. Unless we assume the "alien-origin" hypothesis was true and humans originate from some other planet (which is kind of a ridiculous sci-fi plot but whatever). It's actually a legit scientific hypothesis that life on Earth actually originated from Mars (in other words, it evolved from microbes that hitched a ride on a meteor that came from Mars). So it's really not that ridiculous. Err, I meant the idea that humans as a species originated from outside the Earth. Not that the first organisms to appear on Earth were extraterrestrial. You people are seriously over thinking it. The glowy dodecahedron is just some magic thing to explain the magic instant terraforming. The game BadGuy storylines (after a certain point) and endings aren't canon, same for expansion packs except Firestorm where both campaigns after Cabal has gone rogue for either side happen at the same time and BOTH of their endings are canon. 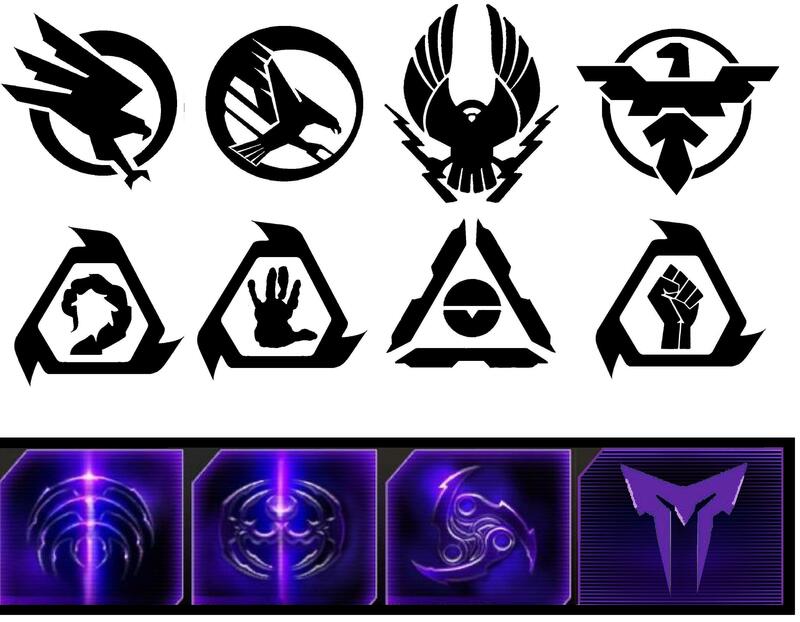 also, did Cabal (including unreleased Incursion), ever had his own Logo/Symbol, or at least in concepts by guys who did prototype graphic for Incursion ? isn't that scrin logo ? @LKO: No, what you posted is the EA redesign, the one posted by Tomson is the original Westwood design for the Scrin logo (Incursion).